Warning - Spoilers for Captain America: Steve Rogers #2 are below. Last month, Marvel Comics shocked the fan community by revealing in the pages of Captain America: Steve Rogers #1 that Steve Rogers, who only just returned to his role as Captain America, has actually been a Hydra sleeper agent since he was a boy. However, despite what Steve Rogers remembers from his childhood, things are not what they seem. 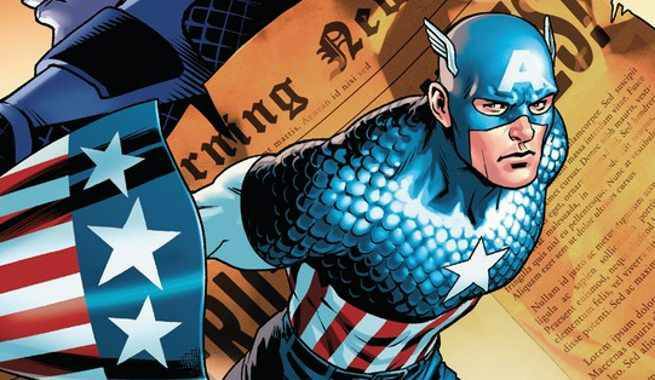 Captain America: Steve Rogers #2, from the creative team of writer Nick Spencer and artist Jesus Saiz, reveals that Steve’s memories of indoctrination were implanted by Kobik, the sentient Cosmic Cube who became a girl. Not only that, but Kobik has been under the influence of Steve Rogers’ most fearsome archenemies, the Red Skull, for months. Has the Red Skull finally broken Captain America by turning him to Hydra’s side? ComicBook.com caught up with Marvel Editor-in-Chief Axel Alonso to ask him about this second twist in Steve Rogers’ story. You can also see the reveal for yourself in preview pages from Captain America: Steve Rogers #2 included in the gallery at the bottom of the page. ComicBook.com: You hear your fair share of pitches over the course of a month, what was it about Nick's that made you excited about it? What was your initial reaction? Axel Alonso: I reacted with the same kind of skepticism I do in most things. My reaction was somewhat similar to how I reacted to the Superior Spider-Man because it's a very ambitious plan and it encapsulated characters in a sinister light. I think what became clear was that there was a real fantastic story to be told through Captain America, a hero who is dressed in red, white and blue, that would build to all sorts of questions and conversations while leading to something very big in the Marvel universe. So yes. It took a little while but I got onboard. CB: Naturally, the story caught fire and was covered by everyone under the sun? Was it the reaction you were expecting? AA: We're trained to anticipate a strong reaction to change or a big plot twist like this, whether it's a female Thor or the new Ms. Marvel or the Korean-American Hulk. We didn't expect the reaction to be anywhere this big. It was comparable to the way that people reacted to the death of Captain America. I think a lot of the people reacting most violently aren't people that go to the comic book stores every Wednesday and are trained to understand the way the comics work and the rhythms and how we could do this kind of thing with our heroes. Obviously, when people read issue 2, it's going to provoke a whole new discussion amongst fans as the truth is revealed. CB: You mention traditional comics rhythm, and usually for this kind of story fans would have to wait much longer for the big reveal. Here, you’re revealing it right in issue 2. Was that key to the story that you guys and Nick wanted to tell? AA: It was a consideration but it wasn't the only thing. I think that they key thing was that in order to tell the story that Nick wants to tell, we needed readers to know that which our heroes don't know. Captain America, one of the most trusted superheroes in the Marvel universe, is not exactly who you think he is. He is operating with a different and sinister intent now and every interaction that we see from here on in will be shaded by that. That's a story that Nick wanted to tell, and that's a story that's going to be fascinating for the next two months and a story that's going to build to big, big things within the Marvel universe as well. CB: We also get the reveal that the Red Skull is back. Are there plans in the story to tell readers where he’s been since we last saw him? AA: All I'll say is all will be revealed. We want this read to be immersive and for readers' questions to be explained in due time. Obviously, there's a lot for people to process. Issue two is going to blow people's minds. It’s a dense read. It's challenging. What it reveals takes some processing. This isn't the time or the place for us to be explaining what the Red Skull's been up to. You're going to be rewarded as we peel back the layers of this. CB: What kind of things can you do from a storytelling standpoint with the notion that a reader knows something the characters don’t? AA: This book features a character dressed in red, white and blue. That type of character is going to deal with themes and problems that are different from, say, the Incredible Hulk or even Spider-Man. Our writer, Nick Spencer, was selected as the writer of this book for a lot of reasons, one of which is the fact that he is very well read on history and on politics, and he's not afraid to tackle some of these issues in the course of our book. I think first and foremost that that's part of the experience of reading Captain America from here on in is that this is a book that's really, really fertile ground for exploring the story of a deep-cover operative. What's more deep cover than the most trusted superhero in the universe operating with an ulterior motive? A sinister agenda? You don't have to search far and wide to start seeing the topical things we're dealing with right now in this post-9/11 world. CB: The book already has a great supporting cast, but will we feel this in other corners of the Marvel Universe? AA: Yes. In big, big ways. CB: The cover to issue #3 seems to show some strife between Zemo and Skull, will Skull have to fend off bad guys and good guys? AA: Well, they certainly do look to be having some strife from that cover. All I can say is there's a reason that it's the next cover. This is an all-in storyline featuring some of the coolest characters from Cap’s history and we're taking it seriously. Like I said, the development and event of this book are not going to be contained within the covers of just Captain America: Steve Rogers. It's impossible. Captain America: Steve Rogers #2 goes on sale June 29.